‘In our small village there are people keen on motorcycles as well as in many other places in the country. 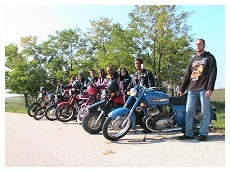 On 20th of January 2005 we formed a group of several guys who think that the motorcycle is not only hobby but a way of life. “Lords of the ways” celebrated its 5 year anniversary this January. During this time we made some changes in the staff but our club is always opened for anybody who enjoys riding. It doesn’t matter what kind of bike you have. What is important is the fact that you ride and enjoy the freedom. We have mainly old socialist motorcycles that we keep in good condition with enthusiasm. We go to various events and racings. We see the bikers as knights who replaced the horses with iron ones.